MR. ALLAN LOCKHEED, who was, at one time, connected with the Lockheed Aircraft Corporation, has been working for two or three years ДальшеMore>>> perfecting the design of a high-wing monoplane equipped with two Menasco engines mounted in an unusual manner. The machine is now out of the experimental stage, and is regarded as an efficient feeder-line aircraft. 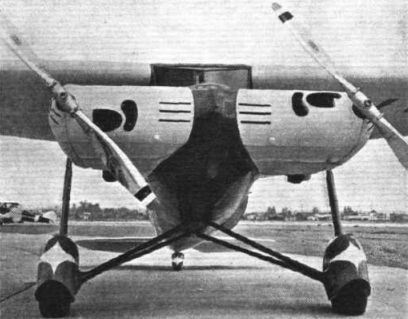 The cantilever wing, fuselage and empennage are plywood structures, and the general layout of wing and fuselage closely resembles that of the Lockheed "Vega." The cabin is 8 ft. 10 in. long, 51 in. high and 40 in. wide, and there is a total baggage space of 40 cu. ft. Four passengers are accommodated in addition to the pilot and co-pilot, but this number may be increased to eight. Hydraulic shock absorbers are used in the vertical struts of the landing gear, which run to the front main spar. Low-pressure wheels, faired with "spats," and a streamlined tail wheel are employed. Two 6-cylinder air-cooled supercharged Menasco "Buccaneer" engines, giving 230 h.p. each, are mounted in a horizontal position with their airscrew hubs 93 in. apart. Hamilton standard controllable-pitch metal airscrews, 7 ft. 6 in. in diameter, are employed. The oil tanks are built into the space between the engines. It is claimed that the vibration impulses of one engine oppose those of the other, and Menasco engines are known to be particularly smooth. It is possible to remove the entire engine group, with oil tanks, as one unit. During recent demonstration flights it was proved that the machine can take off and climb at the rate of 400 ft. a minute from sea level on one engine. When the starboard airscrew was removed the machine took off after a 1,200-ft. run and reached a speed of 130 m.p.h. in horizontal flight. Furthermore, the pilot reported that it handled in a similar manner to a conventional single-engined aircraft. FOR FEEDER LINES: The Lockheed "Alcor" high-wing monoplane. 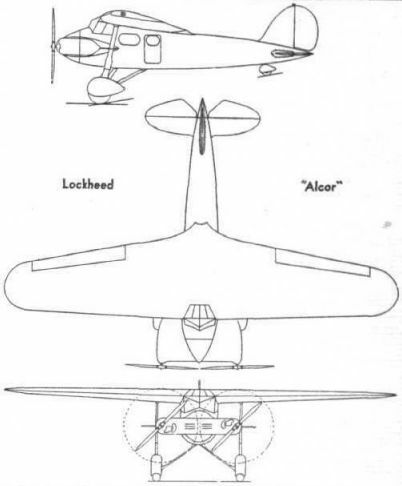 UNORTHODOX: The Lockheed "Alcor," similar in general design to the "Vega," has two "Menasco" engines mounted crankcase to crankcase across the nose of the fuselage. The resistance is claimed to be about half that of the normal radial engine installation.